For almost a year now, their song Summer 2015 has been stuck in everyone's head in France. L.E.J, for Lucie, Elisa and Juliette, co-wrote last summer's hit, which to date has registered over 53 million views on Youtube. 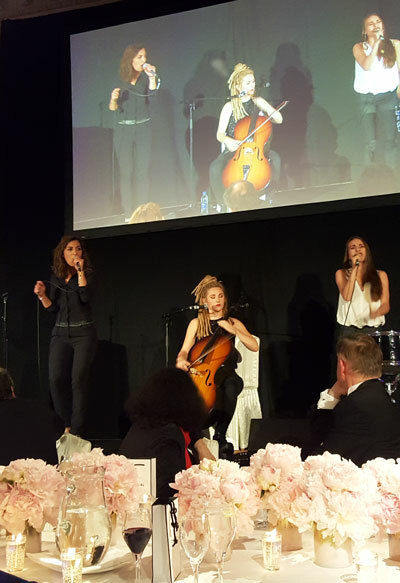 On 14 June, I met the three young women for their first ever concert in London during the French Chamber of Commerce gala dinner. The three relaxed young women, in casual clothes, sit in the Landmark Hotel’s Champagne Room. Among the crystal chandeliers and luxury furniture, this looks quite surprising! 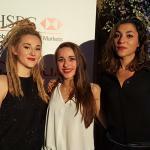 They may have already sung at several galas (and even closed the Cannes Film Festival with Ibrahim Maalouf! ), Lucie, Elisa and Juliette are not phased by their surroundings. Facing me are three absolutely normal 22-year old women. Of course, but in that short period of time, they have played at more than 50 concerts in France and abroad. Show after show, interview after interview, they have been a huge success since last August and their Summer 2015 mashup (see below). Vocals, cello and drum are some of the reasons for L.E.J’s success. They choose international hits, sing them in their own way with tons of energy. They mix hip hop, rap, pop and classical music in their covers. Their music transcends generations. The youngest will love the hits they have chosen while the older people will listen to the lyrical notes. Lucie's deep and melodious voice is a delight, Elisa is a great rapper and Juliette is quite surprising when she plays ultra-modern rhythms on the cello. The trio brings a breath of fresh air to French music. The three women have always been friends. They grew up in Saint-Denis, one of the gritty northern suburbs of Paris, where they discovered music. Juliette played the cello at the Music Academy while Lucie and Elisa were working for a masters in" lyrical chant" at Radio France. Their studies do not seem to fit the typical 93 district stereotype (which young people call “neuf-trois”), which is mostly known for its many rappers. “I remember that in primary school, our classmates were curious and never bothered us with classical music” Juliette explains. “This was even really cool!” Elisa adds. 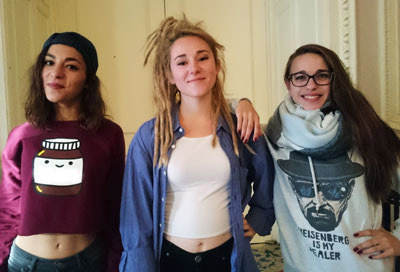 When they have time, Lucie, Elisa and Juliette write their own songs. They have already published La Dalle, one of their works, on their cover album. Their songs will otherwise stay the same, inspired by Macklemore, Nina Simone, Daft Punk and the French rap band NTM. A melting pot of many musical genres, perfectly mixed in their polyphonies. Not many French girl bands have in the past known such an incredible success. Looking forward to seing much more of them! L.E.J. will play more concerts after the summer. ”Why not come to London!” they said. You will be hearing lots more of these girls!